Stood a long way from the edge of the crowd, faces twisted by the heat and the violence staring down at me, I feel more than a little vulnerable. Which is why it’s a damn good job I always carry my sword with me. Cadence Hart has come to a dead end in her investigation into the supply of the Demon Blood drug. Any leads from the phone she recovered from the warehouse have all been buried. Even with the help of her new partner, Matthew – a Soul escaped from Hell – she’s getting nowhere fast. When riots at a Soul Rights rally clear and a body is left in their wake, Cadence and Matthew are brought in to speak to the Souls who might have been witnesses. But investigating the murder puts them up against more than just a DI who’s not too happy to have Cadence on the case, and things needs to be solved quickly, before anyone can claim the murder had a political motivation. In the centre of a political debate that could destroy the fledgling partnership between them, Cadence and Matthew will have to face a few demons of their own before they can bring a killer to justice. You may remember I posted a review for the first in the Hart & Soul series not so long ago (review here–> New Dusk by Liberty Gilmore), well this is the second book in the series. More like a novella, but still plenty to get to grips with! 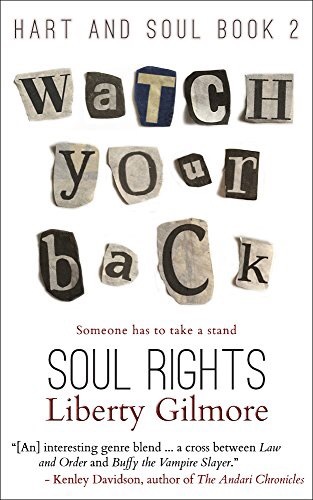 Soul Rights focuses on pretty much that, the political implications of giving Souls rights. After a rally, a man’s body is found and he has been stabbed to death. Cadence and Matthew are tasked with trying to find anyone who may have witnessed anything and what follows is actually a neat little story. I really enjoy these books, even though they are slightly removed from my usual crime books due to the demonic theme. Interesting from the start, but I’d recommend you start with New Dusk first as it is referenced in this one. I find it hard to review short books. Usually they are packed full of action (as is the case here) and by discussing it fully you run the risk of revealing too much. So I won’t. I would highly recommend the Hart & Soul books. For me they are escapism, full of interesting characters and the premise is new and different! Have you read any? Would you read them? ?